Four out of five females infected with gonorrhea do not experience symptoms – males, however, usually do, but they can be mild and therefore easy to overlook. Symptoms can appear within a month, and might include painful or frequent urination, vaginal or penile discharge, painful bowel movements, itching, or sore throat. Additionally, females can experience abdominal pain, fever, irregular menstruation, or bleeding between periods. In pregnant women, untreated gonorrhea infections can lead to complications such as premature labor or stillbirth. The infection can also be passed from mother to infant during delivery. If gonorrhea is left untreated, it can lead to pelvic inflammatory disease in females and epididymitis in males, both of which are conditions that can affect fertility. In rare cases, an untreated person can develop disseminated gonococcal infection (DGI), which can cause joint pain, rashes, lesions, or fever. DGI can be treated, but if it is ignored for too long it can cause permanent joint damage. Additionally, an untreated gonorrhea infection increases one’s chances of contracting HIV, and likewise, an HIV-positive person with gonorrhea is more likely to transmit HIV to his or her partner than he or she would be if not infected with gonorrhea. A photomicrograph of members of the species Neisseria gonorrhoeae, taken from a sample of gonococcal urethritis. Image from the National Center for HIV/AIDS, Viral Hepatitis, STD, and TB Prevention. Though the microbe behind the infection poses a threat to humans, it is, admittedly, a fascinating organism. Neisseria gonorrhoeae is a bacteria species whose coffee-bean-shaped members thrive in mucosal cells of the human body. The gonococci, as they are called, adhere to host cells with appendages called pili (singular: pilus), which are less complex versions of flagella – in fact, there is evidence that flagella evolved from pili. 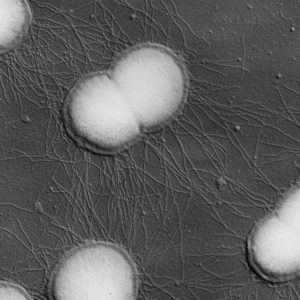 A gonococcus’ pilus is akin to a grappling hook – it attaches to a surface and then retracts, pulling the bacterium into contact with the host cell, to which it can easily adhere. These retractile pili, which are usually bundled together for extra strength, can pull 100,000 times the weight of the bacterium, making N. gonorrhoeae among the strongest living organisms; in terms of proportional strength, it is the equivalent of a human lifting 10,000 tons. N. gonorrhoeae has a few tricks up its sleeves. By hiding inside the host cells, preventing immune response, and destroying antibodies, the bacteria are fully equipped to evade the immune system. The gonococcus’ first tool is its pilus, the appendage that adheres to the host cell. The bacteria then form a microcolony and work together to pull on the host cell’s surface. They can now trick the host cell into allowing entry – where the gonococci are able to hide from the immune system. While inside the host cell, the bacteria can multiply, leave waste products, and do cellular damage. Gonococci also have surface proteins, called Opa proteins, that bind to receptors on immune cells, disabling them and preventing an immune response. The host is also unable to develop an immunological memory against the gonococci – which means that future reinfection is possible. N. gonorrhoeae can also evade the immune system through a process called antigenic variation, in which the gonococcus is able to alter the Opa proteins that adorn its surface. The many permutations of surface proteins make it more difficult for immune cells to recognize the gonococcus and mount a defense. Another item in N. gonorrhoeae’s toolkit is an enzyme that can destroy certain antibodies produced by the immune system. Finally, there is even recent evidence showing that N. gonorrhoeae has incorporated a piece of human DNA into its own genome – though at this point, scientists can only speculate as to whether this gives it evolutionary advantages. Before sulfa drugs and antibiotics hit the scene in the 1930s and ’40s, treatments for gonorrhea were unpleasant and ineffective; one involved inserting a curved metal rod into men’s urethras. Luckily for those of us in the 21st century, nowadays gonorrhea is usually very easy to treat, despite all of its trickery. In most cases, a single dose of an antibiotic will clear the infection right up; in rare cases, more than one antibiotic will be needed. Antibiotic-resistant strains of gonorrhea are out there, so it is important to take the full course of antibiotics that you are prescribed. Infected individuals should also make sure their sexual partners receive treatment to decrease the chance of reinfection. You can receive treatment at a Planned Parenthood health center, as well as other clinics, health departments, and private health-care providers. This entry was posted in Sexual Health and tagged antibiotic resistant gonorrhea, antibiotics, antigenic variation, ARG, bacteria, bacterium, DGI, disseminated gonococcal infection, epididymitis, evolution, fimbriae, flagella, flagellum, GC, gonococci, gonococcus, gonorrhea, HIV, immune response, immune system, microbe, microorganism, N. gonorrhoeae, Neisseria gonorrhoeae, Opa protein, Opa proteins, pelvic inflammatory disease, PID, pili, pilus, retractile pili, sexually transmitted disease, sexually transmitted infection, STD, STD Awareness, STI, sulfa drugs, sulfanilamide, sulfonamides, the clap, type IV pili by Anna C.. Bookmark the permalink. Really interesting – thanks for the ‘inside’ story of how this microbe works. The fact that symptoms are so sneaky is just one more reason to GYT! Nice job again, Anna. What a fascinating read about the inner workings of the virus. Can’t wait to see which STD you write about next month! Also, if anyone would like to see a really cool photograph and video footage (made right here in Tucson at the University of Arizona!) of these microbes, check out these links!